I just received this awesome gift from my sister and brother-in-law for my birthday last Friday. 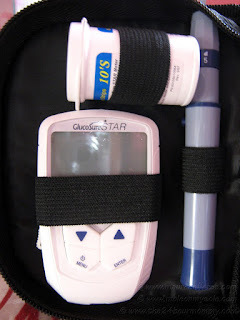 I badly need my own blood glucose meter for easier blood sugar monitoring. These guys love me so much that they even gave me an extra box of test strips! I took my first test yesterday morning before taking my breakfast and the result was ok although it was almost bordering on the low level. Just as I suspected, I took another test two hours after taking my lunch and it already showed a low blood sugar level. It must be because I am having my monthly period and my hormones are going haywire. My new best friend gave me the convenience that I've been wishing for ever since. Now that I can closely monitor my blood sugar levels every day, I should really start getting in shape again. I plan to start walking in the morning again which will be just like taking the best fat burner in town. I told you I knew this is going to be another sweet year for me!